Our experienced personnel are trained in metal fabrication of all types. We have the engineering, machining and welding capabilities to handle small or large projects. From the design to the fit and finish and from the polishing to the wiring, Energy Fabrication has the know how. Give us a call today at 800-946-8645 for custom fabrication. As a full fabrication company we offer welding services on materials that include many different types of carbon steel, stainless steel, and aluminum. We manufacture equipment that is designed to last and perform. We work closely with our customers to ensure that what is required is being provided, both in a timely manner and at a price that is competitive. Energy Fabrication provides our expertise on hydraulic systems that operates many types of pumps, lube systems, cylinder systems and more. We offer ASME code services and testing services for completed products or your components. We are your turnkey provider! Forming and fabrication of complex and simple tanks and shapes is done by our staff of trained and skilled craftsmen. 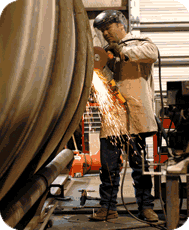 Fabrication of trailers, skids, piping systems, heat exchangers, and direct fired components is our specialty. We offer electrical systems to operate equipment independently or in support of existing equipment. We can build what you need, just give us a call.